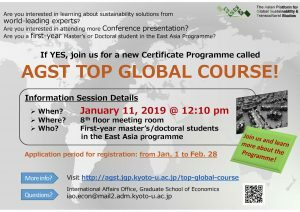 The Graduate School of Economics (GSE) is pleased to announce the commencement of the call for enties for “AGST Top Global Course”. This programme offers participants the chance to take part in intensive courses by invited scholars from abroad. Participants are also encouraged to advance their research at our partner universities in Europe and Asia. Financial support could be available to fund overseas research trips. Participants who successfully meet all the requirements will be awarded a certificate that contains their detailed academic portfolio separately from the diploma at the time of graduation. We currently accept students who were enrolled EA programme in a Master or Doctoral course in October 2018, and this is your only chance to join this course. We are waiting for your application if you have interests in studying abroad, conducting research abroad or if you are just interested in joining the courses by invited scholars. Venue：8th floor meeting room, Faculty of Law and Faculty of Economics East Bldg.